“The Avengers” has been a long time coming. Starting with the post-credits scene in 2008’s “Iron Man” and through the four following movies (“The Incredible Hulk,” “Iron Man 2,” “Thor,” and “Captain America”), expectations around this film have been building slowly but surely. There was a lot riding on this, and it does not disappoint. “The Avengers” has a host of characters to deal with, but writer-director Joss Whedon is an expert at juggling ensemble casts. He doesn’t waste time giving everyone’s back story — each hero gets a little introductory scene, but that’s it. To make a long story short: Loki (Tom Hiddleston) has an army of aliens and wants to take over the world. The only people who can stop him are the mismatched and mutually-antagonistic Avengers (Robert Downey Jr., Chris Evans, Mark Ruffalo, Chris Hemsworth, Scarlett Johansson, and Jeremy Renner). The team gets off to a rough start — Thor’s first interaction with Iron Man is a knock-down drag-out fight — but eventually they have no choice but to work together. In spite of being packed wall-to-wall with action and plot, the film’s nearly two-and-a-half-hour runtime feels much shorter. The pacing is solid, the fights are exhilarating, and the dialog is so sharp that it never feels like it’s dragging. If anything, the biggest flaw in “The Avengers” is that it may not be very accessible to folks who haven’t seen the other films. It isn’t necessary to know everyone’s backstory to enjoy the fights, but it’s hard to appreciate the character interplay without it — and the character relationships are one of the best things in the film. Take, as an example, Tony Stark and Bruce Banner. They bond immediately because of their mutual love of science, but there’s more to it than that. Each of them had their lives changed by a sudden, irreversible accident and gained both power and challenges from the experience. Banner handles his resulting dark side a lot better than Stark does (the specter of Stark’s alcoholism has been haunting the Iron Man franchise), and it’s clear that Stark admires him for it. Being who he is, Stark shows that admiration by constantly teasing, needling, and startling Banner. The rest of the team take it as an irresponsible attempt to get Banner to Hulk out, but it’s easy to see that it’s more than that, that he’s showing that he trusts Banner to keep control. The central relationship of the film, though, is between Thor and Loki. The estranged brothers’ past is what sets the plot of “The Avengers” in motion. Loki’s lifelong feeling of being less-than is what motivates him to unleash his army on the Earth in an attempt to take over. It’s clear from the start that Thor still loves his brother, still wants him to come home to Asgard, but Loki is determined to get a throne for himself rather than go back to playing second fiddle to the heir to Odin’s throne. A superhero movie stands or falls on the strength of its villain, and Loki is able to hold up a film with four movie franchises’ worth of heroes. He’s a complex villain with many facets, from hurt little boy to master manipulator, and Hiddleston juggles them all with ease. The other element that can make or break a superhero flick is the special effects in its fight scenes, and “The Avengers” doesn’t disappoint there, either. The alien army arrives in what appear to be flying lizard-aircraft-carrier-ship-things, which roar and fly heavily around the city as the soldiers zip around on airborne jetskis. The motion capture used to create the all-CGI Hulk is impressive, and he’s utterly believable even as he’s climbing up buildings and slamming aliens around like rag dolls. Even better, the fights are edited and choreographed in such a way that it’s not only clear what’s going on, but everyone gets roughly equal time. 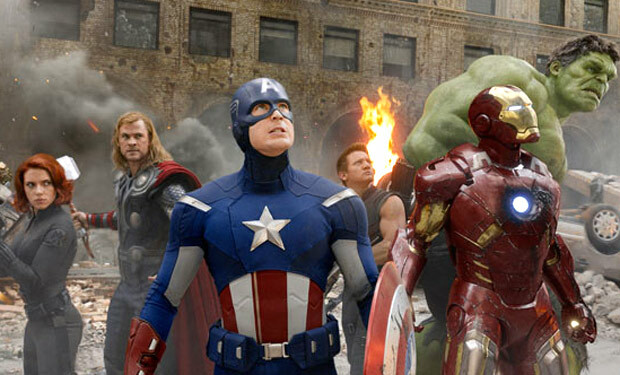 Considering that for the final fight the Avengers’ ranks have swollen to six, that’s more than a little amazing. There are loads of wonderful little moments, but none of them feel tacked-on or forced. Nothing is wasted. “The Avengers” may be a little impenetrable to newcomers, who will have to buckle in and hang on for the ride, but for those who have been watching the movies as they came out and eagerly awaiting the culmination of all this careful setup, it is a thoroughly satisfying and epic movie.